But the last quarter has seen a reversal of this trend. According to data from EPFR Global, inflows into Asia ex-Japan equity funds were $2.8 billion during the September quarter, one-fourth of the inflows in the June quarter. US equity funds had similar inflows, getting $2.9 billion in Q3. 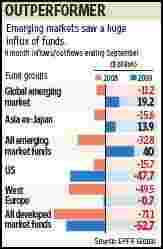 But unlike emerging market funds, US equity funds had seen outflows of $2.8 billion in Q2. Funds investing in Europe saw their year-to-date outflows shrink from $4.5 billion at the beginning of the September quarter to $730 million at its end. Bric (Brazil, Russia, India, China) funds saw average inflows of $80 million a week during the September quarter, down from $135 million a week in the June quarter. Clearly, improvement in business conditions in the developed countries has led to an increase in fund allocation to their markets. Where’s all this money coming from? EPFR points out that outflows from US money market funds accelerated during the September quarter, with redemptions during those three months equalling nearly 90% of the total inflows for 2008. At $3.4 trillion, assets in these money market funds are now almost at the levels they were at before their panic-driven rise after the collapse of Lehman Brothers Holdings Inc. If the outflows from these funds dwindle, fuel for the liquidity-driven rally in equities will start running low.